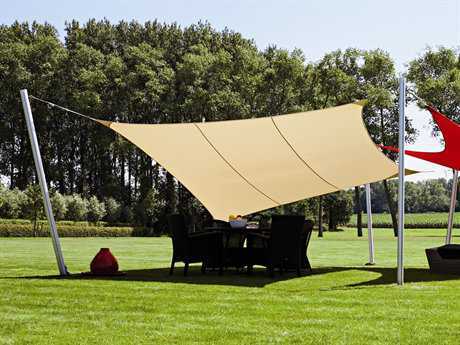 Patio shade sails are the latest solution for providing shade and UV protection for family or guests in almost any outdoor setting. The aesthetic of shade sails emulates the look of sails on a ship, and styles are generally offered in triangle or rectangle shapes. These styles tend to be sized on the larger end of the umbrella spectrum, making them well suited for shading expansive outdoor areas. PatioLiving carries several shade sails options, with a variety of fabric colors, sizes, and shapes available, with current inventory selections manufactured by Luxury Umbrellas, a top umbrella brand known for their beatiful designs, elegant styling, and durable craftsmanship. 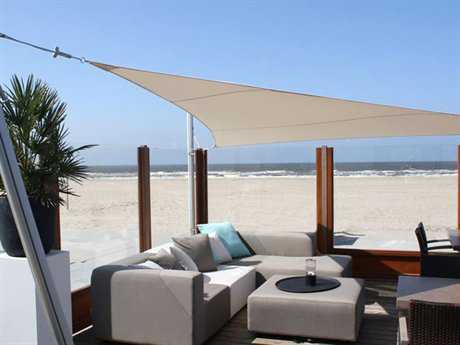 As this umbrella style continues to evolve, PatioLiving anticipates adding many more sail styles to our inventory, bringing customers new and exciting ways to add stylistic and functional value to their commercial and residential outdoor spaces. Sails carry many of the same benefits as traditional center and offset pole umbrella varieties, with several additional bonus benefits. These styles of umbrellas are fixed to objects pre existing in any outdoor space, such as rails, walls, or poles, and create a clear-span shaded area, free from obstructive poles or other elements that hinder mobility and limit the use of your space. These styles are also simple to assemble, making them easy to adjust or move in accordance with the varying uses of your space. Most sails used for shade also feature tracking systems, meaning they can easily be adjusted to continuously block the sun as as it moves across the sky. 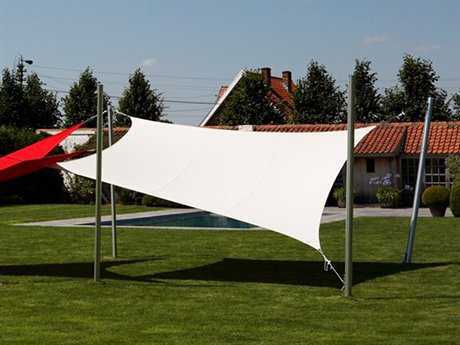 As many styles measure 10’ or above, they are manufactured from premium durable fabrics and include sturdy mounting systems to ensure their dependable use in inclement weather. With anodized aluminum hardware and UV resistant fabrics generally standard, these styles are both corrosion and fade resistant. Design elements such as fabric paneling further ensure the sails’ durability and add a dimensional element of design to their contemporary look. 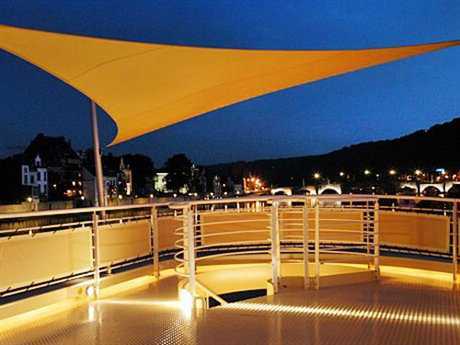 These sails add an element of beautiful, canopy-like overhead protection in any outdoor setting. Their expansive size makes them well suited in any larger residential or commercial outdoor setting. They provide shade protection to an area sizable enough to shelter a patio dining set, a lounge set, or a grouping of smaller furnishings, such as several round bar tables assembled in a commercial patio space. Styled without furniture, they can provide shade over any pool, standing patio, or grassy area. The look of this umbrella type is contemporary and casually elegant, with significant visual impact. A neutral shade sail color selection can be ideal for blending harmoniously with any outdoor aesthetic. Contrarily, a strong hued sail can serve to define the palette for any space with a bright pop of color.